Not everyone has the luxury of being able to hop on their bike and take to the road for a few hours of good hard exercise. However, that might not be a bad thing… we present you a few of the best folding exercise bikes. Did you know that as our roads get busier, riding a bike is not as safe as it once was? Over 20,000 people are thought to be badly injured or killed on our roads each year. This figure is alarming, and it can prevent people from cycling, but there is another option. You don't need to be a cycling enthusiasts to take advantage of the physical and mental benefits of exercise bikes, and although using an exercise bike isn’t the same as getting out on the open road, it can and does have many clear benefits. Folding exercise bikes are a great idea for the home gym as they can save a lot of space, which is perfect for those who don’t have much space to play with, or for those who simply want to store the bike elsewhere when not in use. There are a lot of folding exercise bikes on the market right now, and they can potentially make it difficult to choose between them. We all want to buy an exercise bike that will work well for us, and enable us to get in shape while we enjoy all of its features. The trouble is that for many of us, the exercise bike market is quite overwhelming, and we may not know where to start looking. An upright exercise bike is pretty much the same as a regular bike, the only difference is that no matter how fast you pedal, they won’t move. An upright bike can put a bit of pressure on your feet, legs and knees, but if that’s not an issue for you, you should be able to find a particularly good one with relative ease. This type of exercise bike has been around for a while, but it’s only become really popular in the last decade. Recumbent bikes offer a different riding experience, but because of the way that it’s made, it takes the pressure off the rider’s ankles and knees, and in this respect, it’s easier for seniors to use. What’s more is the seat that comes with a recumbent bike is similar to a regular chair, and it can be pretty comfortable. Spinner bikes may look similar to upright exercise bikes, but they aren’t the same at all. The handle bars on a spinner bike are quite different, and allow the user to bend while they are riding, as this enables them to have an intense workout, and sit in different positions. 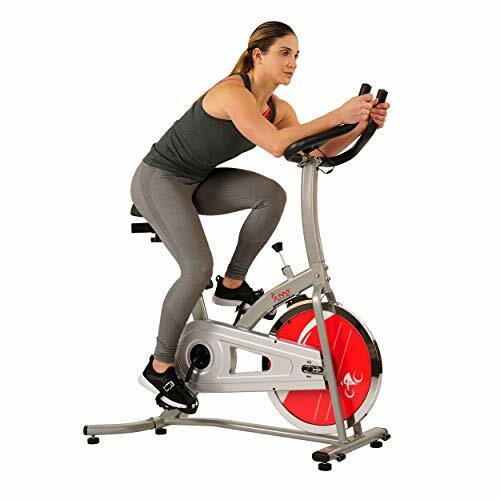 You will usually come across spinner bikes in gyms and health centers as using them as a means of losing weight and getting fit can be very successful. The weight limit may not automatically be something you look out for when purchasing an exercise bike. The trouble is that some people have made the mistake of purchasing an exercise bike that does not hold their weight. Although it is possible to use the bike if you’re over the recommended weight limit, the bike could end up being damaged, as it wouldn’t have been manufactured to support any extra weight. Try to avoid this by ensuring the bike can hold your weight. Every single exercise bike will come with different levels of resistance. The resistance levels are there to ensure you can increase the tension so you have the chance to work your muscles a little harder. Some exercise bike users do not worry about the tension as all they’re looking for is a cardio workout, but adding more resistance will allow your leg muscles to become stronger, and boost your fitness levels. A foldable bike can be ideal if you don’t have much room, or you simply want to put the bike away when you’re done with it. A folding bike is usually the best way to free up some room, while still enabling you to benefit from all that an exercise bike offers. If you’re really stuck for space, work out how much you have spare, and then try to buy a foldable exercise bike that will fold down pretty small, a compact foldable bike may be required in this case. Last but by no means least is the price of the exercise bike. You could potentially spend a huge amount of money on an exercise bike if you were prepared to, of course. Exercise bikes can start at a few hundred dollars, and end up being nearly a thousand, if not more. You should be aware that the more expensive the exercise bike is, the more features and functions it will have. If you don’t want to pay more than you really need to for an exercise bike, then be prepared to end up with a fairly basic one that does no more than it really needs to do. There are a good few factors for you to consider before you part with your hard earned cash, but that’s not necessarily a bad thing. If you know what you need to be on the lookout for, or be aware of then chances are you’re going to end up with a good foldable exercise bike that will help you to enjoy getting into shape. 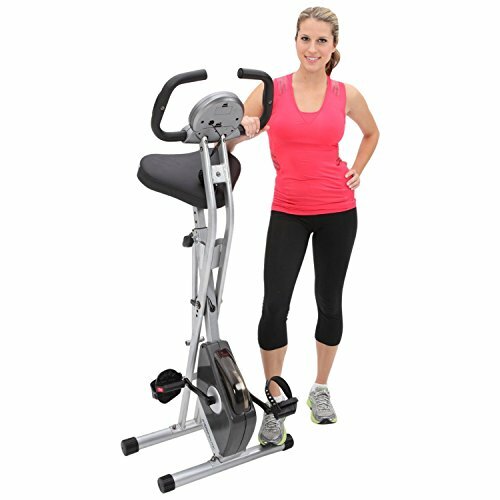 With an impressive eight levels of resistance, and comfortable seating, the Exerpeutic Folding Magnetic Upright Bike could be a good choice for you. The hand pulse monitor enables users to monitor their heart rate, which is ideal for anyone who wants to train in a specific way. With a set of leg stabilizers, this exercise bike will help to prevent movement when it’s being used, and the LCD display shows the users speed, distance, number of calories burned and of course their heart rate. Sold on amazon.com, this bike has an impressive 300 pound weight capacity. Many customers have reported being very happy with the Exerpeutic bike, although a few have stated that the pedals seem a little too far forward. Customers have also found the bike Quiet, and easy to fold. The Exerpeutic Folding Magnetic Upright Bike is a particularly good exercise bike that isn’t hugely expensive, while still providing the users with a lot of impressive features. With the ability to fold it when it’s not being used, it’s ideal for those who wish to store it away. If you’re looking for a reliable bike, then the Exerpeutic may just fit the bill. 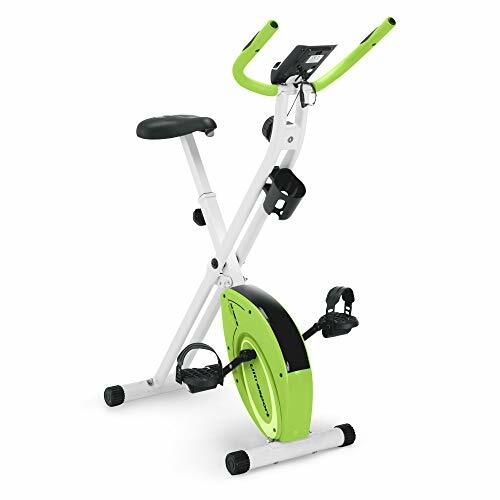 Sold on amazon.com, the Sunny Health and Fitness Indoor Cycling Bike looks very impressive, and should like up to expectations. With a 22 pound flywheel, and the ability to ensure users can enjoy quiet workouts, this particular exercise bike is set to impress. With a molded and padded seat that has been made to ensure usage is comfortable, users may also want to take advantage of the large number of seat positions. The compact design does not take away from the cycling experience as the Sunny Health and Fitness Indoor Cycling Bike has been manufactured using a heavy duty frame and steel crank. Overall, this bike is quite popular with those who have purchased it, although it does not seem ideal for anyone over 6 feet tall. The quietness of the bike adds to its popularity and its quality has surprised many customers. The Sunny Health and Fitness Indoor Cycling Bike is quite a good bike overall, and it will work well for you. The fact that it’s a compact bike does mean that it isn’t ideal if you’re over 6 feet tall, but it’s compact so that it doesn’t take up lots of room. Without trying too hard, this small but useful bike could prove to be a good purchase. The Marcy Foldable Exercise Bike is a relatively simple bike that’s ideal if you don’t want the flashy features that a lot of exercise bikes come with. The computer screen displays calorific information as well as a range of other useful figures. The resistance levels can be adjusted manually, and the seat can be adjusted so it’s as high or low as you need it. Sold on amazon.com, this bike isn’t the cheapest, but it’s been built to last and has a very popular and trusted brand name. Customers have stated that they are very pleased with this exercise bike, and that it’s sturdy for a foldable bike. There have been a few comments about the seat with regards to its design and comfort, but it is easy to fold, and that’s appreciated. The Marcy Foldable Exercise Bike is a good overall bike that users will love if they are not looking for anything particularly fancy. The price matches that of some more ‘Advanced’ bikes, but the sturdy build and the brand name mean it’s a good quality exercise bike. 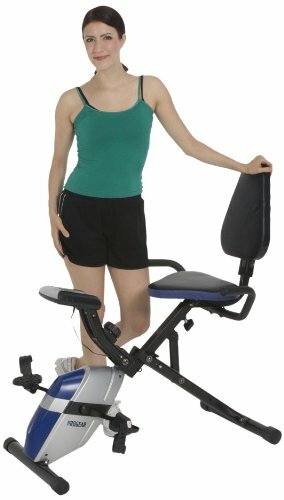 Sold and found on amazon.com, the FitDesk v2.0 Desk Exercise Bike with Massage Bar is a high quality durable bike that has been built to impress. 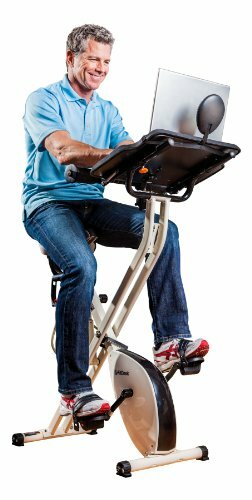 The seat back is adjustable, and the desk that’s attached to the handle bars means you can read or use a laptop while you work out. Easy to fold, this bike can be stored away when it’s not being used, and the performance meter shows you exactly how you’re doing. Customers have reported being very happy with the FitDesk v2.0 Desk Exercise Bike with Massage Bar, as it’s very stable, comfortable and the seat is easy to adjust. The desk is thought to be a really hand feature as it can help you to get on with your work via your laptop that can easily be placed on it. Magazines or books can also be leant on the desk too, and the storage drawer that comes as standard is also a particular favorite. The FitDesk v2.0 Desk Exercise Bike with Massage Bar is a high quality exercise bike that is ideal for anyone who has a busy life. Used at least 5 times a week, this bike can help you to stay fit while you work. The comfortable seat makes using the bike a pleasure, and the durable design means it’s built to last. Sold on amazon.com, the ProGear 190 Compact Space Saver Recumbent Bike is a bike that’s well worth considering. Although this bike is a recumbent one, it doesn’t mean that you cannot enjoy using it, the recumbent feature simply means this bike has been designed to alleviate pressure that is usually felt in the knees and legs. Customers seem to be very satisfied with the ProGear 190 Compact Space Saver Recumbent Bike, as it is very comfortable, and easy to assemble. There have been a few complaints about the LCD display not working properly, but that’s not an issue most customers have. The ProGear 190 Compact Space Saver Recumbent Bike isn’t a bad exercise bike at all, and it could prove very beneficial to anyone who wants to cycle at home, without putting pressure on their joints. Built to last and easy to assemble, this bike appears to be well worth the money.